Recording on the go just got a whole lot better. IK Multimedia announced iRig Pro I/O, the successor to its highly popular iRig Pro, the personal mobile audio/MIDI interface for iPhone, iPad, Mac, PC and Android devices. 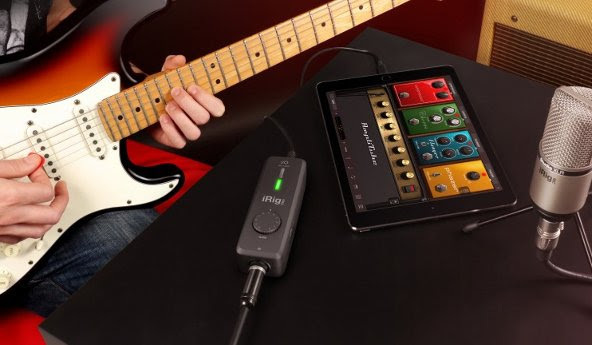 iRig Pro I/O is a simple "plug and play" interface that lets musicians hook up all of their gear - guitars, basses, studio mics, vocal mics, keyboards and more - to their mobile devices or computers and record 24-bit/96kHz pro-quality audio and MIDI tracks anywhere, any time. iRig Pro I/O features a high quality 1/8" headphone/line out with level control for use with the latest Apple devices like the iPhone 7 to connect to headphones, mixers, or powered monitor speakers in an ultra-compact enclosure that fits in a pocket and can be carried anywhere. At its core, iRig Pro I/O is professional audio interface - it gives players the ability to record 24-bit audio at up to 96kHz sample rate. This high-resolution ultra-compact interface rivals traditional desktop interfaces and provides stunning audio quality anywhere. The iRig Pro I/O preamp features a marked precision input gain control to adapt to a wide array of input signals giving it a tremendous amount of flexibility in a super-compact design. iRig Pro I/O features a multi-colour LED indicator for visually optimising the input gain level and monitoring of the input signal to prevent clipping. For real-time monitoring on the go with the latest iPhones, iPads and computers, iRig Pro I/O features a high quality 1/8" headphone/line output with level control. Users can hook up their headphones, connect to a mixer, or hook up a set of powered monitors like iLoud Micro Monitor. Either way, the headphone/line output delivers pristine, crystal-clear audio for ultra-accurate representation of the audio program. iRig Pro I/O features a Neutrik™ XLR/¼" combo input that lets users plug in all their gear - from dynamic, condenser or ribbon microphones to unbalanced Hi-Z or line level instruments like guitars, basses and more. iRig Pro I/O features a switchable 48V phantom power feature for powering condenser or active ribbon microphones. With the adjustable input gain control, users can easily recall and replicate the input gain setting for their instruments, and the multi-colour LED provides a visual monitor of the input signal gain setting. iRig Pro I/O is the complete music production interface and provides amazing tools to make inspired music thanks to $/€543 MSRP worth of included IK software. Users get full versions of IK's award-winning titles like AmpliTube 4, AmpliTube for iPhone and iPad, SampleTank 3 SE and T-RackS Deluxe with Mic Room.